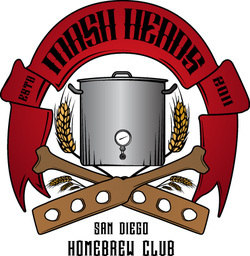 Mash Heads is a small San Diego based homebrew club dedicated to educating our members on the science of homebrewing while focusing on fun and camaraderie. Our mission is to promote awareness and appreciation of all aspects of the brewing process as well as beer judging through education, evaluation, and open discussion. We are a proud member of the San Diego Homebrewers Alliance, an umbrella group that was formed by local homebrewers for the purpose of supporting each other as well as to promote homebrewing to the San Diego community. The Mash Heads meet the 2nd Wednesday of every month at White Labs (9495 Candida Street, San Diego, CA 92126), from 6:30pm-9pm although we do enjoy visiting different breweries / brewpubs, therefore we sometimes meet at a different location. We gladly welcome guests, however, we kindly request that you RSVP to sdmashheads@gmail.com if you are interested in attending one of our meetings for the first time. In addition to our regular monthly meetings, we host club brew days and a BJCP study group, enter homebrew competitions, and participate in and host other special events. Join us today!